It’s March! Meaning it’s officially spring break season–let’s hit the beach! Before hitting the salty shore, we are rounding up a few the best beaches and pairing them with an item from our NIIRVA shop. Can you say spring break 2018? Cocoa Beach, Florida. 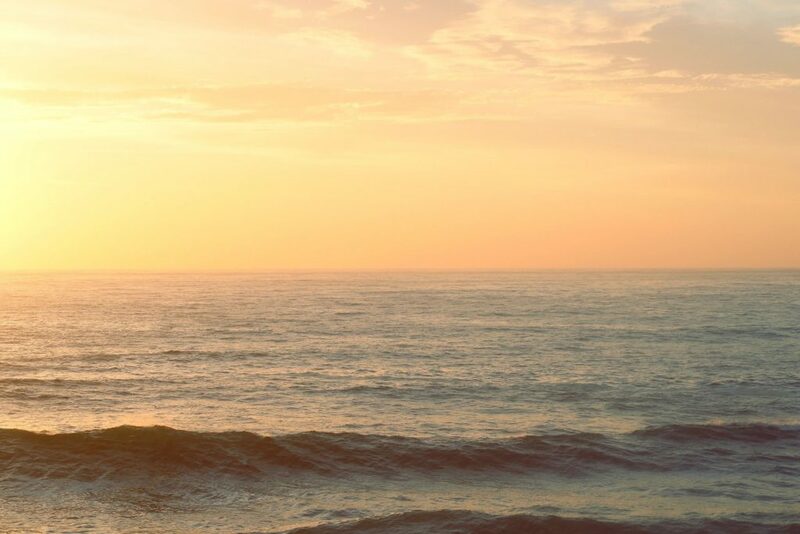 Whether you’re a native Floridian or a visitor, this beach has everything from water sports, wildlife attractions, and even the nearby Kennedy Space Center. These layered necklaces are great for the beach or yacht dining! Crystal Cove State Beaches, California. Are you into camping like a true Californian? Nearby beaches are the infamous Newport Beach and Laguna Beach–surely you’ll get some Insta-worthy views of nature and mountains here. Wire bangles for the vacation win if you decide to forgo your tent and hike to a California resort. These three string earrings will fit inside your carry-on. Southampton Village Coopers Beach, NY. Call upon your inner Blaire Waldorf and hit the Hamptons. Sure, the Atlantic is a bit chilly this time of year, but clean beaches and local shops make for a great trip! These blue beaded bracelets are a hinting for long walks on the beach and a good read by the pool. Kiawah Island, South Carolina. Beautiful views and ample greenery for a round of golf and vacation drinks await you here! Carry your mini golfing accessories in this pretty gold pouch. North Shore, Oahu. First, we’ll go whale watching and then we’ll hang-ten in the surfing hub of one of the nifty-fifty states–Hawaii! Our Sun Turquoise Necklace matches the Hawaiian waters perfectly! Fall is (possibly) the best season for fashion and wardrobe re-inventing. After all, it’s a time to pull out your favorite cozy closet staples and buy a few new pieces to mix in. Here at Niirva, we’re all about BOHO glamour and fun music festival vibes, but agree that it’s always fun to transition with the seasons. This fall, we are loving faux and natural suede, soft leather, fringe, a pop of unexpected color (like darker yellows), and boho accessories. Anything from wide brim felt hats to ankle booties are on our radar. In our Niirva shop, we have items you can add to your fall attire too. Here are a few fall goodies to try on and take home aka our Fall Must-Haves. Basically, scarves are the cold season’s accessory that never phases out. 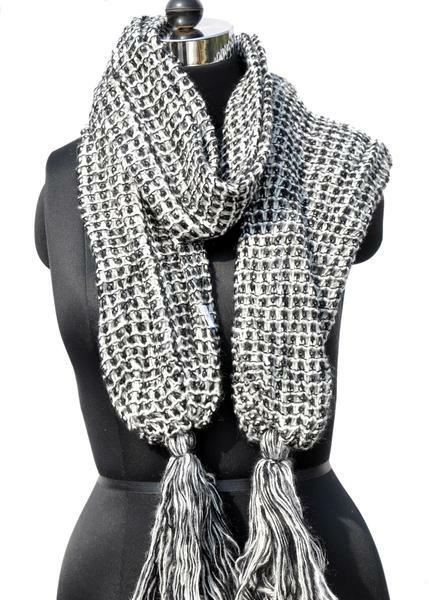 You can’t go wrong with a warm classic gray scarf this season. Rich and warm yellow hues are an unexpected way to add a bit of a fall glow to your OOTD. 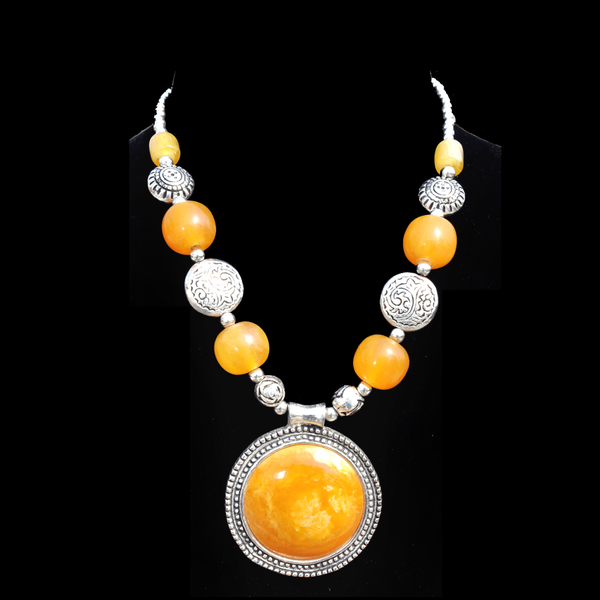 This golden yellow Surya necklace will do the trick! You can’t completely leave florals behind once fall arrives. 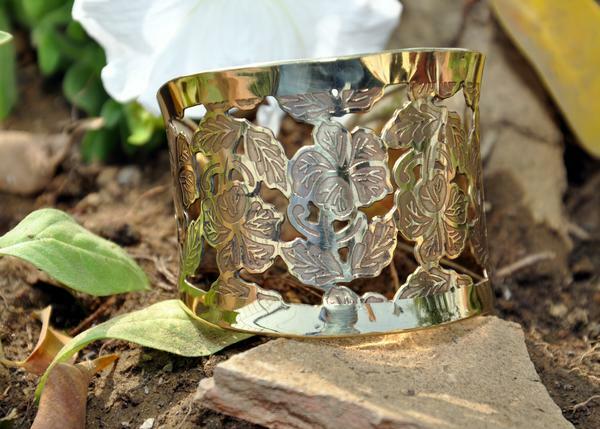 Just a simple flower design on a gold metal cuff will be just enough for the cooler months ahead. Be sure to use #InspiredStyle & follow us on Instagram! “Baby put your pom poms down for me. Come on shake it up 123. Baby put your poms poms down for me.” So goes the Jonas Brother’s song, ”Pom Poms.” However, we are not talking about the 123 go team kind of pom poms, but the recent fashion additions that have been popping up across the social media-sphere as well as on the hottest blogs like Carrie Bradshaw Lied. Recently, pom poms both large and small have been seen on straw bags, beach totes, sandals, cover-ups, and purse charms. While the size, style, and texture of the pom poms vary, they all have one thing in common–color! Yep, these trendy lil’ and big poms are super colorful and look great when they are grouped together. The biggest social media phenomenon with the pom pom craze is the lace up gladiator sandals adorned with yes, pom poms. Recently, Etsy shops across the globe have been popping up creating these avant garde sandals from scratch. 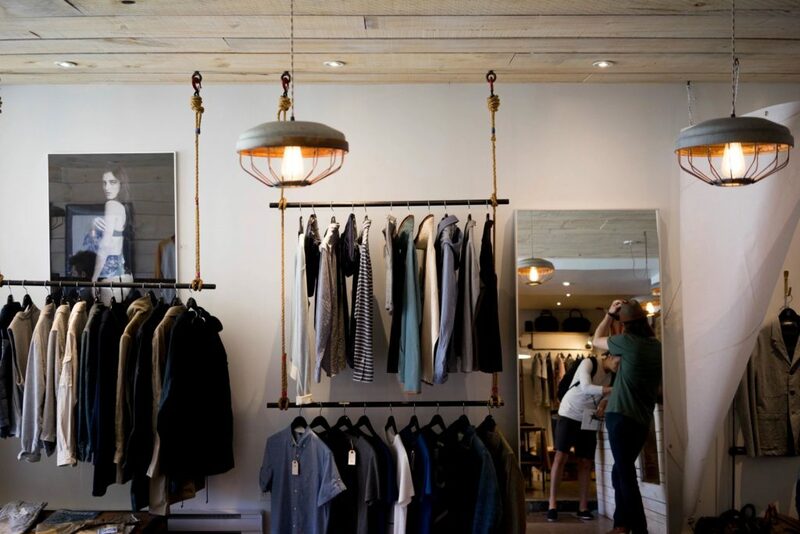 One shop that caught our attention is called Dimitris Workshop located in Athens Greece. Their tie up gladiator style sandals are decorated (to the max!) with colorful poms, tassels, and beads . 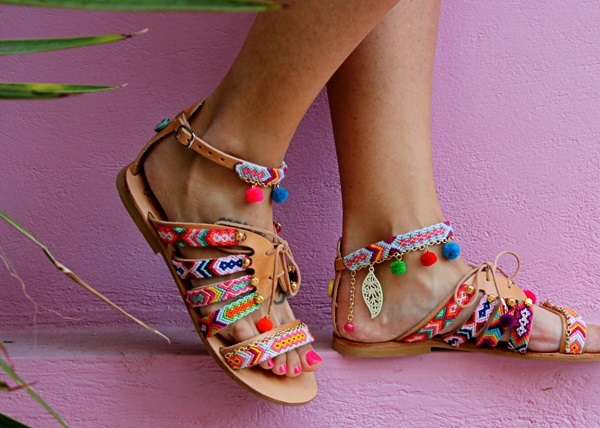 These bohemian beauties run about $183.00. No, they’re not from the House of Dior, but owning a pair of these babies is sure to rack up your likes on Instagram. We particularly are loving how Kathleen from the blog, Carrie Bradshaw Lied created her pom pom look. 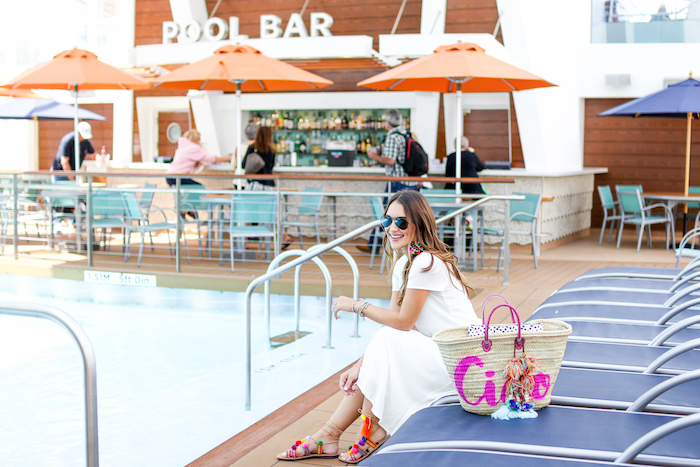 Her BOHO lace-up sandals came from the Etsy shop, Sandals of Love while her ‘Ciao’ straw bag accompanied with pom pom charms came from the online retailer, ShopBop. However, ShopBop and Etsy are not the only ones to get in on the pom trend. We here at Niirva have a few pom poms up our selves. 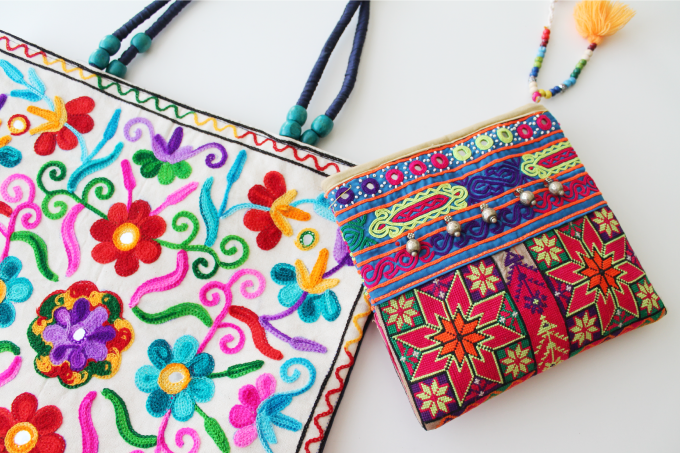 Have you seen our embroidered Kutch purse? This small clutch, was created by the artisans from the Kutch regions of India. It has a fun and colorful beaded tassel with adorning pom poms. This 2016 summertime trend is meant to be a bit wild, a bit fun, and a tad out of some comfort zones. Whether you are a kindred BOHO spirit (like we are) or are looking for a unique way to spruce up your summer attire–pom poms are the way to go! Add a few to your bag, your shoes, beach hat, and cover up. If you think you added too many, it is probably safe to add at least a few more. Share your BOHO summer look with us #Inspiredstyle. It’s about that time again when kids, tweens, teens, and undergrads are heading back to school. When we were in school – years ago! – we remember the anticipation of every school year and the new adventures that awaited us. One of our very favorite things to do in preparation of the new year was to get new school accessories. Backpacks, book totes, gym bags, computer cases, pens, pencils, and more. This year why not make a real statement with our totes that are perfect for toting around all your school accessories. 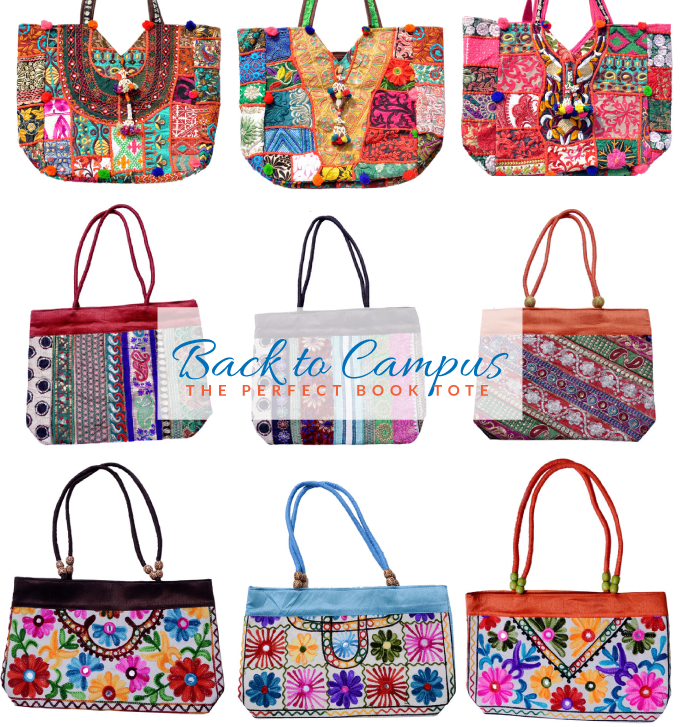 Kutch Tote Bag: Big and spacious able to carry all your school necessities. Zari Tote Bag: We’ll call this our medium bag. Fits books and a tablet without a problem. Embroidered Small Tote Bag: Made for the no-fuss fashionista. Just big enough to fit your planner and favorite gel pens! We’re crushing hard this week on coral. Coral summer accessories are a staple year after year. This summer we’re loving coral looks from The Darling Detail – those pants! and The Style Bungalow. We want coral everything, but if you’re not quite ready to commit to coral in your clothing adding in an accessory is a great way to get your feet wet. We’ve got lots of fun coral options ranging from necklaces to clutches. Now to choose which one! What’s your go-to color for summer? We want to know! Give us a shout on twitter or instagram @shopniirva. Note: This post contains affiliate links, which means we’ll make a few cents (literally) if you click on the products and buy ’em. If you’re not heading on a tropical vacation this year, we sure bet you’re dreaming of one like we are. We’re dreaming of island sun, crystal clear water and long nights under the stars. 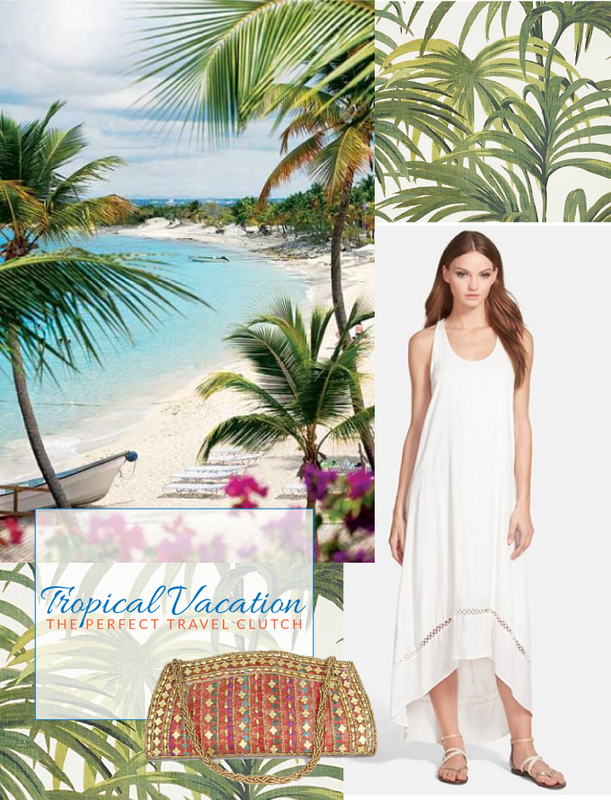 At the end of the days on these tropical getaways we like to keep our style easy and elegant. Throw on your favorite maxi dress and add our Clutch Purse with Sequins to add that little touch of glam. Are you heading somewhere tropical this summer? If so, where to? We’re heading down to The Keys this week and this summer clutch bag will be the perfect accessory to pack! Let’s talk about your purse preference. Here at Niirva we can literally use a different purse every day of the week – so many options. Lately, for me, I’ve been carrying around our Embroidered Tote Bag. I love that it’s big and can fit all my daily essentials. It has one small pocket which is great, but it’s not quite enough. For a while I tried to make the one pocket work for me, but it wasn’t happening. Then it dawned on me, I could use the Embroidered Kutch Purse as a catch all for all the small necessities I tote around with me every day. It’s working like a charm! If I don’t want to carry my large tote, I can toss the things I need into the purse and use it as a clutch. I tend to do this a lot when I’m going out to eat or running a quick errand. Enough about my purse preferences what are yours? Are you the crossbody type or large tote type? We want to know! 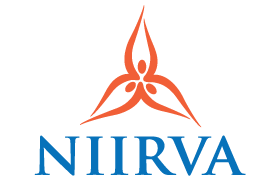 We’ve got some Niirva Styled for you today! 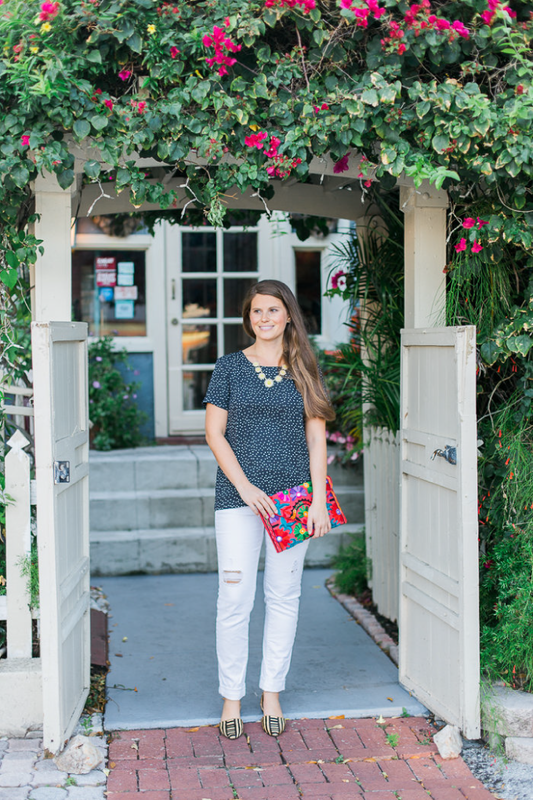 We are obsessed with how Marianne of The Things We Didn’t Buy styled our Floral Clutch Bag. It’s a perfect accessory for spring. To see the full outfit post stop on over to her blog. If you’re anything like us we’re dreaming of warm spring air and beginning to browse our favorite sites for spring fashion inspiration. 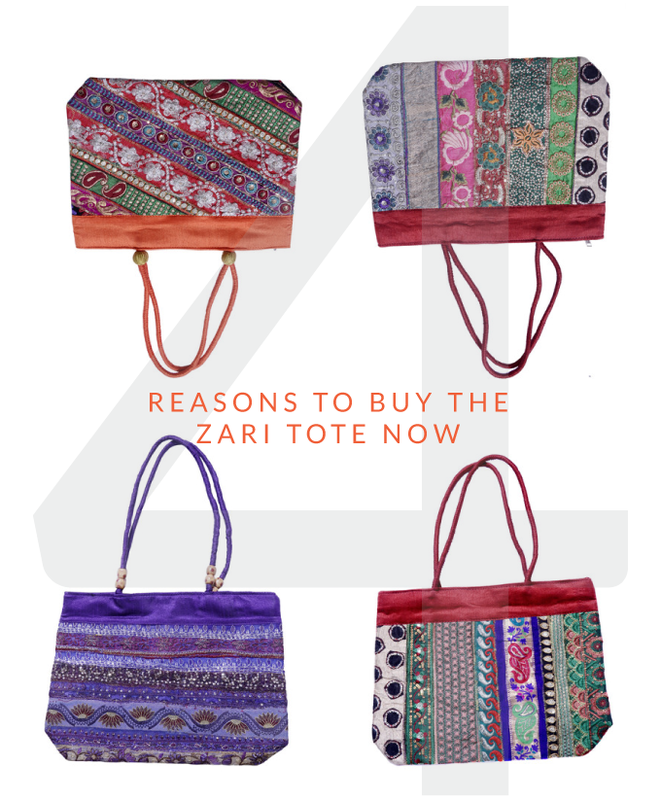 Before you decide on any old tote to get you through the upcoming spring read our four reasons to buy the Zari Tote. 1. Marsala – no, not the wine. We’re talking about Pantone’s color of the year found in many of our Zari totes! 2. Planning a Spring Break getaway? It’s great for travel. Fits your 13″ laptop, tablet, magazines, books, and all your other travel accessories. 3. It’s unique! The color options available coupled with the great prints and patchwork on each bag make them almost one of a kind – easily showing off your personal style. 4. The price! At only $29.99 it won’t break the bank making it quite the spring wardrobe essential steal. Ready to buy your Zari Tote? Shop all the patterns here. Happy Monday! We’re back this week with inspiration on the multiple uses for your Niirva Tote. First look is for a day at the beach. We mentioned we are based in South Florida and although there has been a bit of a cold snap here this week we’re waiting for the temps to rise slightly so we can pack our Niirva tote full of beach essentials and catch some rays. Not in sunny climate? Then let this be an inspiration to book a beach getaway! 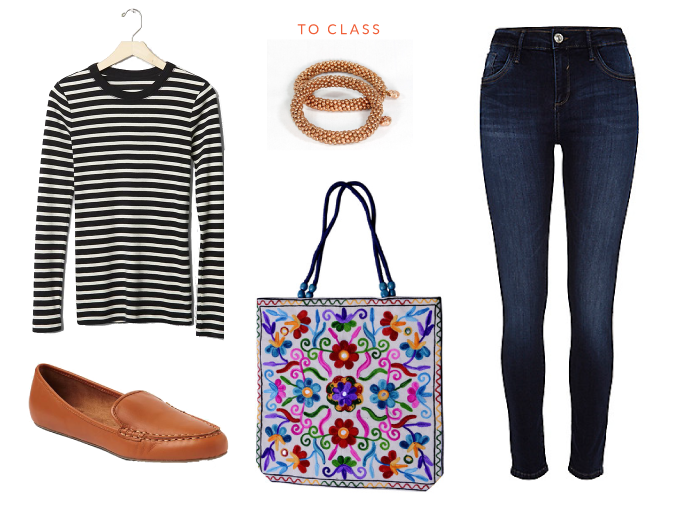 Our second look is for our girls that are trying to get through this spring semester. Whether it be high school or college, our colorful totes will be sure to brighten your school days and give you that extra dose of happy to get you through to the end of the school year. Only one month until Spring Break! 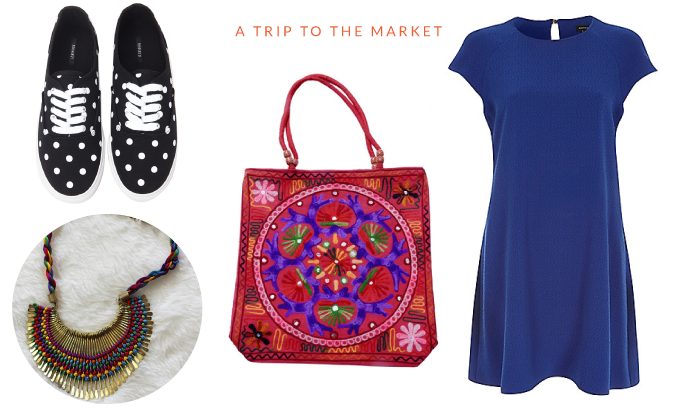 Look three is all about the trip to the market. Living in the cold? Add some tights, boots, a cardigan, and one of our scarves to make the look more winter-friendly. Pack your list, your essentials, and load up the tote with all your market finds! How would you use our tote? We’d love to know. Leave a comment here or let us know on instagram or facebook with the hashtag #niirvastyle.